I was recently sent a crate of oranges as an invitation to participate in the Live Well, Go Orange campaign for Citrus Australia, where they're challenging/encouraging Australians to eat an orange everyday for ten days. I was ever so gleeful when it arrived. Fruits always seem to look extra-wholesome in a wooden crate, don't you think? I'll be keeping the crate, it might work nicely as a mini bench, or as some kind of storage solution. 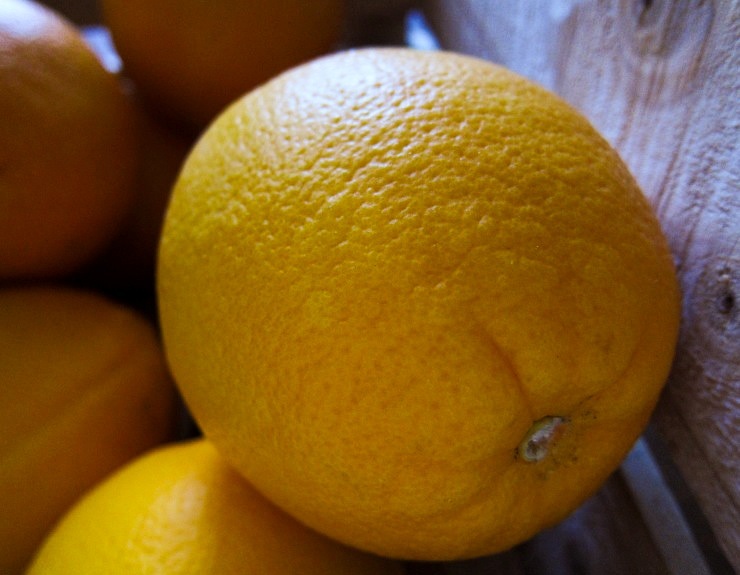 a dozen oranges in a wooden crate. So for these past several days I've been eating oranges. I've cut them up and eaten them fresh in all their glory. I've made an orange and olive oil cake, adapted from this recipe. I've also offered one to Simon when he was struck by midnight cravings, and together we concocted a snack by filling up a bowl with a cup of yoghurt, orange segments, a scattering of cacao nibs, and a drizzle of honey and plum coulis. As you can imagine, we had a lot of fun, and I'm feeling mighty fine. 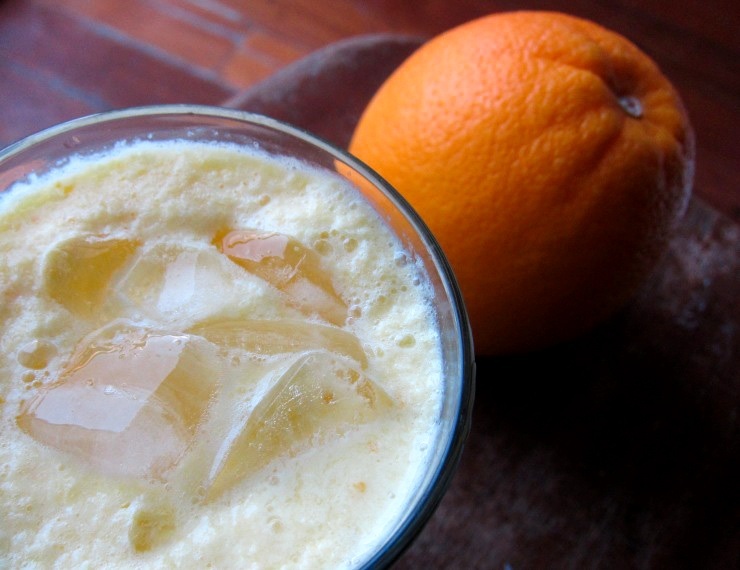 The recipe I'm sharing with you today is that of a pretty healthy soft drink, inspired by oranges and their health benefits. I used not only the flesh of oranges here, which are a juicy source for a variety of nutrients (vitamin A, B, C, as well as fibre, folate, potassium and calcium) but also the zest, which contains an even more concentrated amount of the good stuff. It's all whirled together with yoghurt and maple syrup, then topped with soda water, for something refreshing and a little different. Are you up for the Go Orange challenge? What's your favourite way to have oranges? 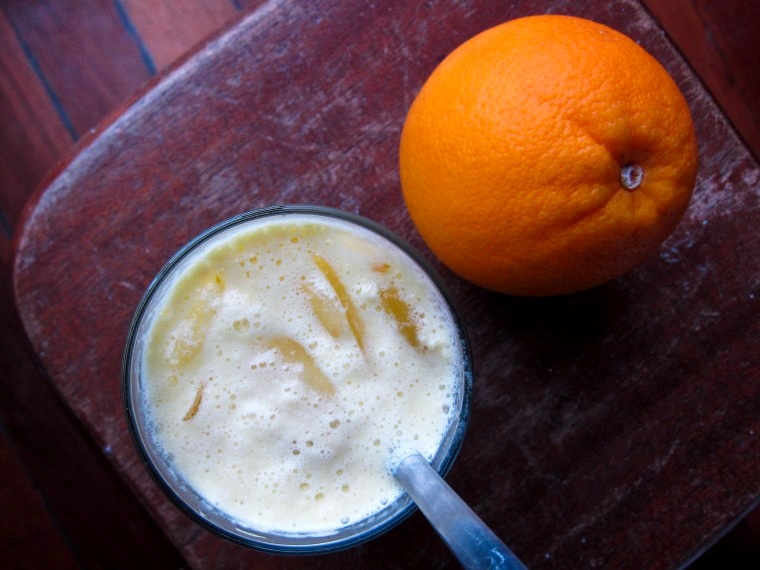 Blend orange zest, orange segments, yoghurt and maple syrup together until smooth. Pour into a large glass, or divide amongst two glasses, depending on whether you're sharing. Top up with sparkling water and some ice. Stir gently to incorporate. If you're feeling indulgent, make it a dessert - throw in a scoop of vanilla ice cream for a delicious float! Ingredient amounts can be adjusted to suit personal preferences. I used plain unsweetened natural yoghurt but feel free to use your favourite, and create interesting combinations! Wow I love Oranges and that looks so refreshing. Love it. That looks lovely! I found a place today that sells calamansi-flavoured frozen yoghurt - I imagine this tastes just the same! Wow, calamansi fro-yo sounds like it would be amazing. OH GOD THAT CHALLENGE SOUNDS LIKE MY PERSONAL IDEA OF HELL. This looks like heaven to me. I love fizzy + orange + creamy together! woo that fizz looks fab! i do not eat enough citrus, though i so love orange cakes, and have a couple of faves (let me know if you need some!). how lovely to have a gorgeous wooden crate too! much more romantic and pleasing than cardboard. oh like a fizzy lassi1 Brilliant! I wish they would send me oranges :) Although my dentist banned me from acidic fruits. No pineapple or oranges :( boo. Love the orange crates! These looks delish! And pseudo healthy of course!